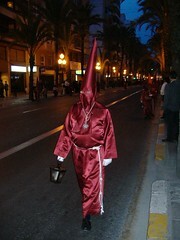 Last night we went into Alicante city to see the Good Friday processions. As you can see from the photograph here, we were slightly alarmed that the Ku Klux Klan were in town… but rest assured they are the Brotherhood (or Cofradï¿½as) and this is their traditional dress. After the street procession, we headed into San Juan de Playa to meet up with Lynsey & Co. for a few drinks at the Harley Bar.